Every day millions of dollars of goods in 18 wheel transport trucks drive along what is known as the Caledonia bypass, crossing the Grand River through a rural area west (north) of the town of Caledonia. They cannot drive through Caledonia since the 9 span concrete bridge can barely handle car traffic, and Argyle Street at that point is choked with vehicles at almost any time of the day. The bridge over the Grand River on the Caledonia bypass was designed to handle heavy transport trucks and us locals always assumed that it would eventually link up with the present Highway 6 where it ends near White Church Road. Yet to happen. The DCE property where the present barricade is located at the junction of Argyle Street South and Surrey Street. The junction of Argyle Street South and the Caledonia overpass can be seen in this map. If perchance there was a major accident on the bypass, the regular vehicle traffic would be funneled down Argyle Street South which joins Highway 6 about a kilometer from the present barricade. However the problem is extreme for large tonnage vehicles. There is no other crossing point for transport trucks other than huge detours to north of Brantford (Highway 403), or to Cayuga (Highway 3). Any local will tell you that this would at best be a nightmare; as would any increase in traffic along Argyle Street. "The Ontario broken promise blockade across Highway 6 (Argyle Street) just outside Caledonia may be moving just as Haldimand Mayor Ken Hewitt says internal Six Nation support is waning. Turtle Island News has learned the blockade may come down Saturday and move to the Caledonia bypass. Sources said those at the barricade debated shutting it down after complaints were received from businesses along Sixth Line. 'We don't want to see people lose their businesses so we decided we will move the barricade Saturday', said one source. Turtle Island News has not been able to confirm the reports received from two people at the site. But the protesters did receive threats of removal last Thursday (Aug 17)." So, it appears that there has been pressure by local (Six Nations) businesses to move the barricade. The thought to just fold up the tents and go home does not seem to have occurred so, the closest option would be to move shop to the Caledonia bypass - guess that the debris field will be left on Argyle Street for Caledonia to clean up. Once again, there is nary a whiff of concern for Caledonia businesses who are in some cases in dire straits - click here to see a report on this problem, the "protestors" are only concerned when their own people are impacted (some have probably threatened these "barricade managers"). The Caledonia bypass is part of Highway 6 (Argyle Street is known as "Old Highway 6") and extends from the lights at the junction between Argyle Street (which ends there) and Highway 6 northward. 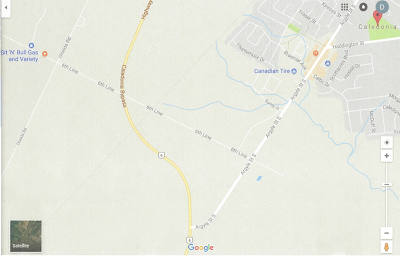 Any potential blockade could be placed between this point, the bridge across the Grand River, all the way to Green Road which funnels into the extreme northern end of Caledonia at Argyle Street north (also known as Highway 6 and Upper James Street - old Highway 6 from Hamilton to Port Dover was once known as the Plank Road). If this does come to fruition, there is an up side to this in that there would be significantly more pressure on the OPP to dismantle the barricade and arrest the "protesters". This time the Province would be affected, and one effect is that the transport companies would be furious. This would NOT in any way put pressure on Ontario to give the Burtch lands to those with whom they did not negotiate a deal (although the luminaries behind the "protest" don't understand this). The only outcome would be arrests and hopefully stiff fines against those so callous as to disrupt the lives of thousands for no valid reason. It is interesting that the editor and reporter of "Turtle" give a name to the blockade, namely "The Ontario broken promise blockade". No other news outlet has done that, and I will leave it to the reader to ascertain the significance. Also note that the "protesters" (aka thugs and criminals) don't mention any Caledonia businesses, only those on Six Nations. So once again my point that they don't give a tinkers da*n about Caledonia's people is reinforced. The supposed action will take place tomorrow, so more then. Later next week I will be in a position to gravitate to the front lines (if there are any at the time) and provide more pictures and an on site perspective.